This content is courtesy of AirGMS, all-in-one vacation rental management software specifically for Airbnb businesses. It allows users to control bookings and alterations, guest communications, as well as automate day-to-day operations. Lots of people tend to believe that Airbnb business automation is just for large companies. However, there are quite a few ways that you can conveniently automate your rental business as an individual host as well. The process of automation refers to implementing repetitive and automatic sequences for handling to-do’s such as adjusting property pricing, answering emails, and other tasks that you’d normally handle manually. This frees up time on your plate that you can spend elsewhere. 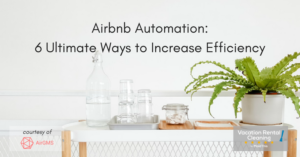 Here are 6 ways you can automate your Airbnb processes and maximize your efficiency. This is pretty much the key exchange procedure. You can easily automate this process and spare a serious amount of time for both you and your guests. There are quite a lot of ways to do so – you can simply tell them where to find the lock box and how to return the key when they leave. Additionally, you can use a smart lock which is, by far, the newest technological invention. It allows access to the property once it receives a verified wireless signal from your smartphone. You can also use electronic locks which eliminate the entire hassle of having to use keys. This option gives you the advantage of generating a unique entry code for each guest.. Regardless of what you go for, automating this process will alleviate a lot of hassle. You won’t have to schedule your affairs around the check-in and check-out times of your guests. Sensors can help you automate a range of different “routine” activities at your property. For instance, you can have a motion sensor turn on and off the lights – this can seriously reduce the electricity bill. Furthermore, for safety reasons, you should have a carbon monoxide and a water leak sensor which detect when you have a certain issue at your property that could lead to serious issues. You can easily integrate sensors with different applications such as SmartThings in order to create rules for how your automation devices respond when the sensor detects a certain event. For instance, you will receive alerts from the application if your water leak sensor detects water or if the temperature changes. As an individual host, you need to make sure that your property consistently maintains at a temperature that is comfortable for your guests. Automation units are particularly helpful when it comes to heating and cooling your property. When you install this unit, you can rest assured that the ambient temperature in your place is going to be reasonable. You can easily check it, usually through an integrated smartphone application. Automating your cleaning can also be especially efficient in terms of cost and effort. You don’t have to be a one-man band. Consider hiring a cleaning company for turnover or occasional cleanings. If you believe you have some more important things to do (like growing your business), this is something that that could really save you time. Besides, you can easily include your expenses as a cleaning fee. This is a matter of a balanced Airbnb pricing strategy. Responses to your email and message queries will improve your overall customer service. What’s more, failing to provide prompt responses can actually get you penalized. This is something that you should consider. Using an auto-responder can help you alleviate some of that stress. Most platforms allow you to set up preliminary automated messages which will provide quicker responses to your guests for more efficient Airbnb management. You’ll be able to include a range of different information, including Wi-Fi passwords, check-in as well as check-out policies, directions to your property, key-exchange instructions and other important information. Personalize the message in a way that would appeal to all guests. Vacation rental software spares many a vacation rental host a lot of effort and money. Thanks to comprehensive automated approaches, vacation rental softwares easily manage a bulk of your affairs for you. For example, AirGMS is a convenient software platform that hosts a range of features to automate the business side of your Airbnb venue. Vacation rental software programs handle tasks like guests’ communication management, messaging automation, notification automation, setting up different templates, price management, and much more. They’re also equipped with calendars that enable you to conveniently track your bookings. While it’s certainly true that automation can’t eliminate the work in its entirety, it is capable of alleviating a significant amount of effort that you’d otherwise have to put in. Moreover, it also reduces the possibility of miscalculations and helps optimize profits.